We are highly adept at providing excellent quality Computerized Wheel Aligners which are known for technically advanced features and are offered with 17" flats screen and key board for easy operation and better resolution. These are provided in different specifications, sizes, designs and are provided at industry leading rates. 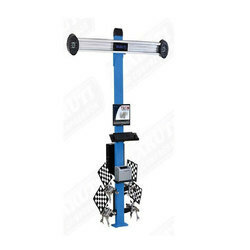 Computerized Wheel Aligner with 17" flats screen and key board for easy operation and better resolution. Based on 4 high resolution sensor heads and a console for user friendly operation. · High precision high speed industrial camera-LED 3 dimensional Imaging Camera. · Interactive Software provides demo screens that assist the technician to easily proceed systematically through the adjustment process. With standing rugged use occasional dropping. · Software has been designed to be compatible with windows 7 and capable of future up gradation. · Optional Wireless Remote controller to navigate between the different stages of software. · The repeated measurement Error is within international standard+/-0.04 dg which meets the need of super luxury cars, more accurately. · Super Low chassis vehicles can be detected. · Professional Adjustment programme (Volkswagen VAG special procedures) for Audi AG Pass at B5. · Vehicle pushing dynamic measurement without rim compensation, only 2 minutes to read the basic parameters. 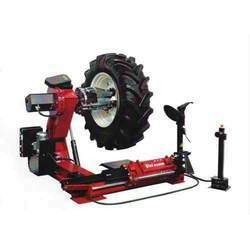 · Universal Truck Tyre Changer, Equipped with 2-speed hydraulic chuck 5 Rim locking different positions. · Movable control unit, Rim size 13” – 27”,Max diameter 1600mm/63” Max wheel width 780mm / 30.5”Technical Data. Looking for Computerized Wheel Aligner ?